The desire to leave a legacy that persists long after our lives are over is encoded in our DNA. Some of us just have kids and call it good; others do something extraordinary like inventing stuff or going into space. Yourbot is a device and service that’s meant to make it fun and easy to leave a part of you behind for many, many generations. The people behind the development of Yourbot call it “a time machine for the future.” The device lets you more or less digitally store your history and your personality for future generations. You take a 3D scan of your head and answer a series of questions developed by researchers from Princeton University, and the device creates a version of you that your great-grandchildren can converse with. The physical device connects to the Yourbot database via wi-fi, so future generations can put the Yourbot viewing device on a tabletop (assuming they have tables in the future) and talk to you. You don’t have to type your whole life story all at once; you’ll answer a few questions a day via the app or web interface to build up an informational database. The questions range from simple and basic to timely and complex. You’ll record information about your childhood home, then weigh in on current (for you) world events. You’ll go on to describe your experiences in school, talk about your first kiss, and discuss your socioeconomic status. Future generations will be able to ask you questions via speech recognition software, and your digital 3D avatar will conversationally answer with your own words. We love the idea of being able to record pieces of the present and preserve them for the future. However, Yourbot isn’t really that different from writing a journal or keeping a video diary. 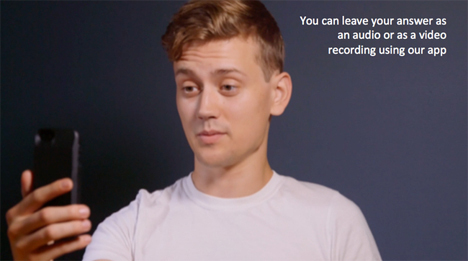 In order for your face to actually speak your words with your voice, you have to record your answers on the device in video mode. There’s nothing wrong with preserving information in that way; it’s just that when we picture a “time machine for the future,” we envision a 3D rendered version of ourselves culling information from a robust database of information and having actual conversations, not just playing back pre-recorded messages. The draw of the Yourbot seems to be its data storage plan. When you purchase a Yourbot, the company promises to store the information you record for at least 200 years. There’s even an option to record two personalities on the same device, so you and a spouse or other loved one can tell your individual and shared stories. 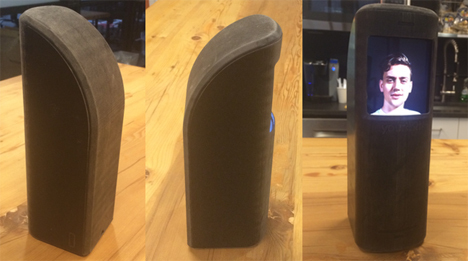 As of the time of publication, the Yourbot project is seeking funding through Kickstarter. For $100 you can upload your digital answers to the Yourbot database for 100 years. 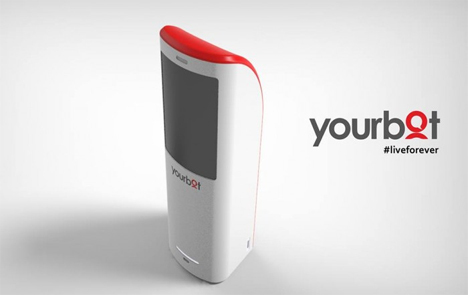 Starting at $250 you can get your very own handheld Yourbot and 200 years of data storage. See more in Futuristic or under Technology. October, 2014.